Palmako 28mm wall log Veronica Octagonal Summerhouse. The Palmako Veronica Summer House is a sectional summerhouse using 28mm wall logs. It is the smallest Octagonal summerhouse in the Palmako range. There are two Veronica Summerhouses available with two windows (Veronica 2) or four windows (Veronica 4). 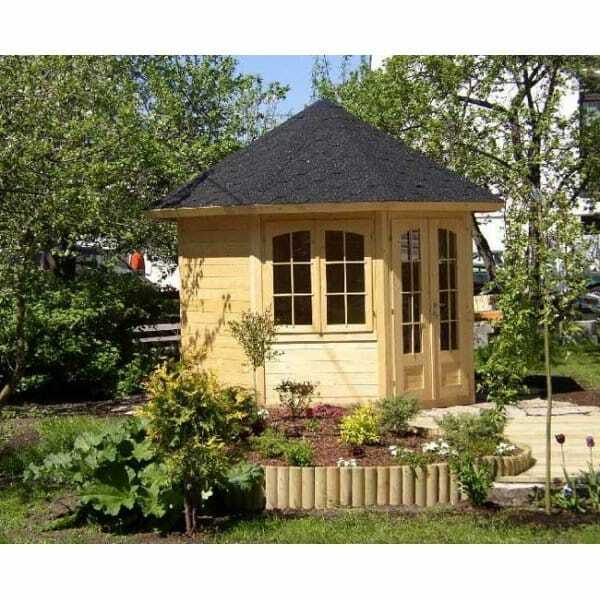 This Octagonal Summerhouse / Log Cabin Summer House would provide a real focal point in the garden and is ideal for entertaining or just relaxing and enjoying your outdoor space. If the Log Cabin is to be assembled in a restricted space; there should be an allowance made for roof overhang to the both sides and rear of the building of 30cm roof overhang. Showing 2 of our total 3 reviews, with an average rating of 5 stars. Read all 3 reviews for Palmako Veronica 2 and 4 Octagonal Summer House. Review - Summerhouse delivered in a timely manner on a large pallet, assembly was a two man job over two days and was relatively simple to understand, base easy, side panels easy, roofing felt time consuming, roof panels heavy and hard to locate, but overall not a bad assembly. Finished product is brilliant, very good quality and looks the part. Summerhouse delivered in a timely manner on a large pallet, assembly was a two man job over two days and was relatively simple to understand, base easy, side panels easy, roofing felt time consuming, roof panels heavy and hard to locate, but overall not a bad assembly. Finished product is brilliant, very good quality and looks the part. The summerhouse makes a very attractive garden feature. Painted with Farrow and Balls coriander and fitted with cedar shingles it looks just as good as those sold in John Lewis at almost £9000. The shingles were expensive at around £175.00 and quite labour intensive to fit but make all the difference. We didn't fit the wooden slats to the doors and windows preferring the appearance without.